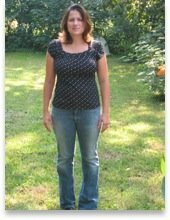 I also have a non scale victory to share... 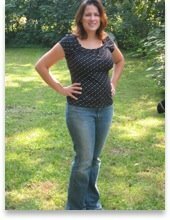 I bought a pair of size 8 jeans and they fit! They fit real good. In fact- I might have to buy another pair because my 10's are a bit baggy. Oh I cannot express how good that feels. 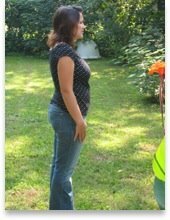 I visualized myself months ago getting into a size 8 jean for the Fall and I've done it! 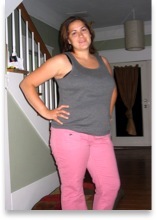 I was a size 14 when I first visualized that. One of the "tools for success" that Weight Watchers talks about is "anchoring." Learing how to visualize something so strongly that it helps you in the moment to do the right thing and focus. It worked!! I feel sooooooo good! I had lunch with a friend Sunday and we were walking around in the mall talking about "life" things. I just kept saying how much my life has changed since getting on this Weight Watcher path. It's been so long since I've had the focus to visualize something and accomplish it. I used to pride myself at being able to do that when I was in high school. I was athletic, creative, fun loving...I just loved being a woman. Then something happened and I slowly lost my luster. And then once it was gone, I just kinda embraced myself as I was. And while that sounds relatively healthy- it really wasn't. I think I just talked myself into settling with something I wasn't at all happy with. I could have easily settled into adulthood as an over weight woman. Heck- I could have rationalized it and accepted it. But I know I would have never really been happy with that part of me. And it was that realization that triggered me to do this. Life is too short to gain and lose the same 5 lbs and lament about my body. I'm tired of feeling sorry for myself and half way doing a diet and then giving up. I can't tell you how relieved I am to have finally tackled this and am on the right track. I got a hair cut today. I was feeling so "saucy." I just told my hairdresser to do what he wanted. I love it! I kept my length, but added layers and bangs. Feels good. I tell you what also feels good. To not decide on a hairstyle in correlation to my body size. You girls no what I mean. I'll post some new pics soon. I need a good one with my new hairstyle and new SIZE 8 jeans!!! On the upside- I went shopping with a friend on Sunday and I tried on a size 8 jeans. They fit!!! They were really tight- but I got them bottoned! It felt so good to get them on. :) I didn't buy them though. Mostly because my birthday is next month and I know I'll be 8 lbs or so lighter and would like to spend my birthday money on new clothes. It was so funny because I really enjoyed shopping. I can't remember the last time I really enjoyed shopping. It was great. Goal for this week is to drink more water and limit eating out to one time. I'm trying not to get too focused on my gain. It's just so hard when you go from an average 2 lbs loss per week to a .8 gain. Eating in will help me to control the ingredients in the food (which helps me know the actual points) and portions. I bought a Weight Watchers cookbook called In No Time. There are lots of yummy recipes in there that I want to try. I'll post another update at next Monday's weigh in. Tootles! Weighed in last night and was down 1.2 lbs since Thursday! It was nice being back at my regular meeting. And I was so glad I went because one of my friends got to goal! She looked great and she couldn't stop smiling. I clapped so hard for her when she went up to get her keychain. I can't wait to get to my goal (135 lbs). I just gotta keep doing what I'm doing. I tried a new recipe tonight that I got on a card at my meeting. Kiwi-lime pork chops. SO good and only 5 points! Bascially you just broil the pork until done. Then on the side in a bowl you peel and dice 2 kiwi, add crushed pineapple (in it's own juice), juice of one fresh lime and as much cilantro as you want. I put it in the food processor for a couple seconds just to blen it more- but you don't have to. It was a nice, clean, fresh meal. Nice change. I also steamed some broccoli and sauteed some fresh spinach with garlic and onion. All zero points and packed with nutrition. After dinner I had 9 points left! So I had some chips and salsa and a Smart Ones dessert. I love those days that get away from you and you end up with a bunch of points to splurge on. Maybe next Monday I'll in the 150's!!! Here are some updated pics. Man- I'm getting there aren't I? YAH! I was 162 even this morning when I took this pic. Went to weigh in on Thursday (not my usual meeting day but I wanted to get in a meeting this week). I lost .2 lbs!!! Now, I know that's not a lot compared to my average 1.5 -2 lbs per week but I'm counting it as a major success because I was sure I'd gained and I was terrified to get on the scale. There's nothing like a vacation with ALL FOOD FREE to blow you diet. But when there's a will, there's a way. I made a way to lose. I'm really proud of myself. The leader (not my usual leader) talked about how we give ourselves permission too much. "It's my birthday." "I'm going on vacation." "I've been good so far, might as well have a few days and splurge." Sooner or later that permission turns into a month long binge fest. I could so relate to that. It was funny she talked about that because I was able to share how in the past I've always given myself permission on holidays/vacations to blow my "diet." And I shared how I planned well to not blow it this time AND I still ate food I loved. I'm finding that if you plan well, you can do Weight Watchers any time, anywhere. You just have to be determined. Before "being determined" meant missing out. At least that's how it seemed to me. But now I plan and then the stress isn't there when the food is in front of my face. Sure- while in the Caribbean I thought: "Ya know? I think I just ate too much. Or I probably shouldn't have ordered that margarita." But that's all part of the journey. You just pick back up and make the best decisions you can. I'm planning on weighing in at my normal Monday night meeting. (Even though I just weighed in on Thursday) I miss everyone and miss my leader. I haven't seen them in 2 weeks. She's so motivating. And a friend of mine there is really close to goal so I hope I didn't miss her reaching it. I want to celebrate with her! I'll post the results. This morning I was 162.4 lbs That's a pound lost since Thursday. I wouldn't be surprise if I lose a lot because I'm getting back to my normal eating routine and drinking a ton of water. My goal is to be 155 lbs by Sept 31st. We'll see.... I will say my size 10's are getting awfully baggy!!!! YAH! I'm back from the Caribbean!!!! And....I maintained my weight! It would have been great to lose- but I knew that would be especially hard. We were at a 5 star resort and had all our meals paid for. I tell you what- it was sooooo tempting not to order fries. For some reason that was the biggest temptation. For breakfast I ordered the tropical fruit plate every morning. It came with fresh mango, pineapple, grapes, cantelope, and honey dew melon. It was so juicy and yummy! It made it easy not to eat the pastries. For lunch I stuck with salads with chicken. Dinners I'd eat grilled fish, lobster and shrimp. SO yum. The seafood is so fresh there. One night I let myself split a chocolate cake with my mom. That was good but I honestly found myself full after a couple bites. It was so rich. I tried my best to keep track of points- but it's so hard not knowing the ingredients and portions. I got back yesterday and I got right back to business. I even had an extra point left last night and didn't spend it. SHOCK! I got on the scale this morning and it said 164 lb even. I'm going to try and make it to a meeting tomorrow night. I really need it. My leader is so motivating and inspiring. I need to jump start back into my routine again. I'll post after my meeting tomorrow night.